Well, better late than never, I always say! Jonathan managed to hunt down the split times from the weekend’s Rotterdam marathon, which by now, you probably know was won by Patrick Makau of Kenya in the 2:04:46. It makes him the fourth fastest marathon runner in history, and the way the race was won suggests that Makau’s name can now be added to the list of men who have a realistic shot at breaking the current world record. The Rotterdam race also produced the fastest fourth placed finisher ever, as pointed out by the guys at Letsrun.com – a 2:05:23 by Feyisa Lelisa (only 20, maybe himself a contender for a 2:04 some day) good enough for fourth! It really is a remarkable era for men’s marathon running. The list of men who are capable of breaking that record is growing every time a major marathon is run – Gebrselassie has done it, Wanjiru, Lel, Kebede, Kibet, Kwambai (though since his 2:04:27 he has had two forgettable performances), and now Makau. You might even add Geoffrey Mutai to that list (a sub-2:05 performance is worthy, even if it was in second!). And I’d add Zersenay Tadese to it as well. These are indeed great days to watch men’s marathon running! 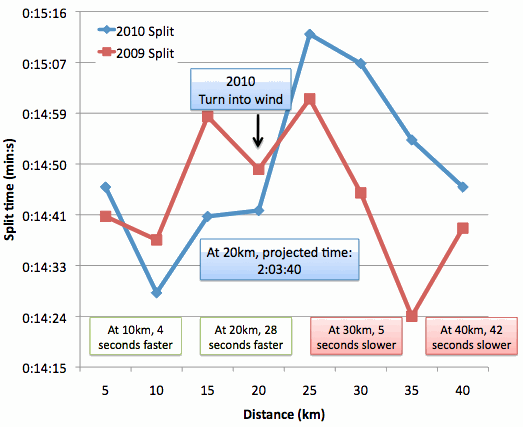 The graph supports this – you can see below how the pace in the 2010 race was faster all the way to 20km. At that point, the projected time was 2:03:40, and the pace was 28 seconds faster than in 2009. From 30 to 40km, the “gap” opened even more, and 2010 was 42 seconds slower than 2009 at 40km. That happened despite, or perhaps because of, the surges in pace that the runners seemed to be putting in over this interval. It was aggressive racing, albeit at a slower pace than the year before. A final observation is that the final 2 km were covered much faster in 2010, which does suggest that Makau has a little more in the bank. He said as much after the race, saying “Of course I was capable of doing the world record, if there was not a strong wind”. I think it comes across a little more confident than intended after translation, but the point remains, Makau finished fast – 23 seconds faster than Kibet in 2009, giving him the 2:04:46, 19 seconds slower than the race last year. How much faster can he run? Kwambai has learned the hard way that great performances don’t predict future great performances, even when you feel that the training has been perfect. Twice now, he has been reduced to walking in the final 10km of marathons, and Letsrun are reporting that he covered the final 7km in about 40 minutes, and basically walking the whole of the last kilometer. Makau may experience the same in the future, but after a 2:06:14 on debut, and a 2:04:46, he’ll enter his next marathon marathon (Berlin, New York, Chicago?) with a target firmly on his back and aspirations of the world record. We look forward to it!